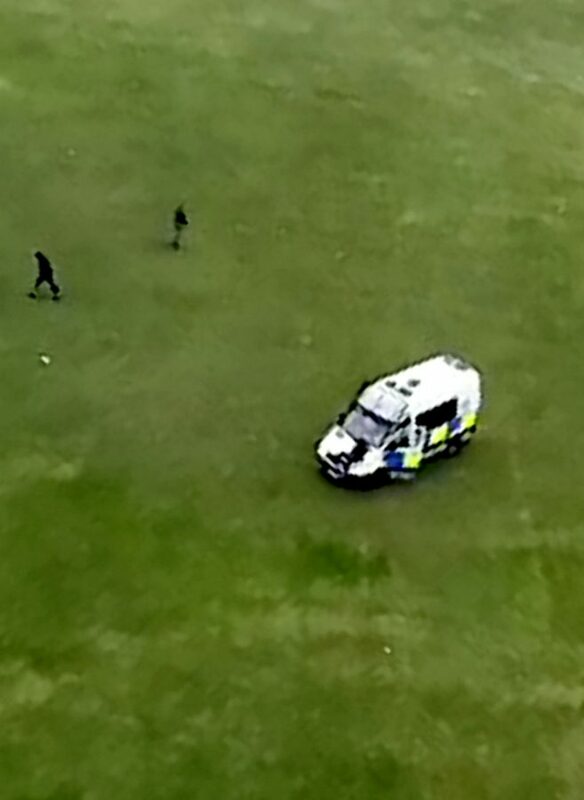 This is the moment a teenager appears to jump into the path of a police van after officers were called to investigate youths allegedly causing trouble in a park. The shocking clip shows the van zooming across the grass, prompting more than a dozen kids to disperse and run away. But the van caught up with one lad who collides with the vehicle – after he appears to jump through the air. A spokesperson for Police Scotland confirmed an arrest had been made following reports of antisocial behaviour and disorder in Moredun, Edinburgh, on Monday. They said no link had been established between it and the attempted murder of a 16-year-old on Sunday, but both enquiries are ongoing and any links will be looked into. One onlooker, who filmed the collision from an overlooking flat in Moredun, Edinburgh, said: “I was just making a cup of tea and was chatting to my girlfriend when I heard all this screaming and shouting from outside. “I hadn’t even realised there were easily 30 youths gathered on the green. “They were all dressed in black and wearing balaclavas, hoods, and winter scarves to cover their faces. “I spoke to someone who claimed they’d smashed cars and set stuff on fire. 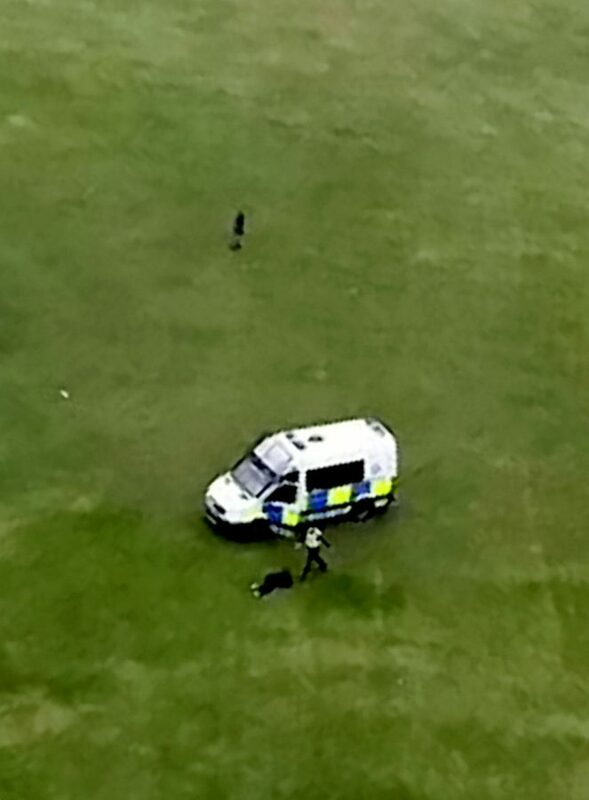 “Suddenly these two police vans mounted the grass and drove towards the group. “To start with, it looked like they were just breaking the crowd up. “But then you can see one of the vans drive straight towards one of the boys. “It had been raining, and when a van is driving that fast on soft grass – I know, because I take my dog on there – it’s not stopping in time. The incident happened on Monday at around 6.30pm. Eyewitness said there were six police vehicles – four vans and two cars – in attendance. One said police appeared to be searching for something in the grass, while the group of youths jeered at the officers from the side. The eyewitness claimed police had made the arrest after an attempted murder on Gilmerton Road the previous evening. 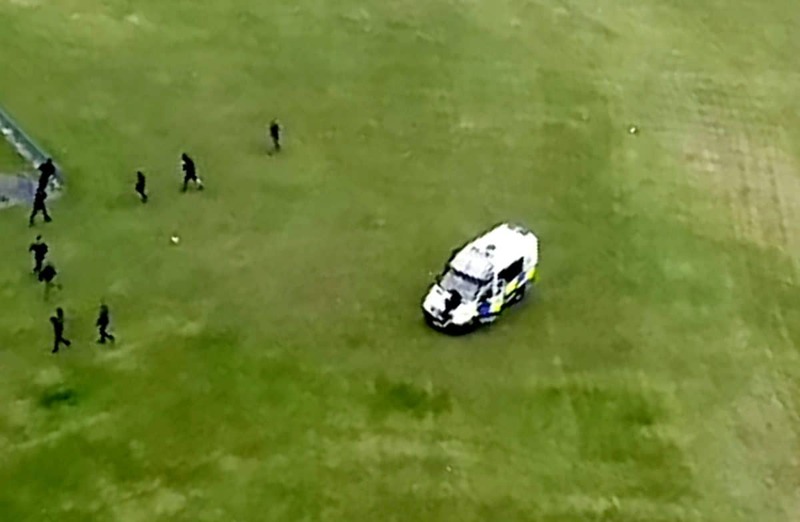 Supt Mandy Paterson from Edinburgh Division said: “From around 6.30pm on Monday 15th April, officers in the South East received numerous calls relating to youth disorder and antisocial behaviour within the Moredunvale Park area. “Police were quickly dispatched and on arrival, the youths made off. “Whilst in attendance, a 16 year-old male youth was arrested for a breach of the peace and outstanding warrant. “We have confirmed this person collided with a police vehicle immediately prior to his arrest. He did not require medical attention as a result of this. “The full circumstances of this collision are being investigated and the Police Scotland Professional Standards Unit have been informed. “Inquiries to identify those involved in the disturbance are continuing and I would like to thank all members of the local community who have supported us with information. “Local officers are proactively identifying and visiting those involved last night with a view to preventing any repetition and would seek the support of local parents or guardians in ensuring knowledge of the whereabouts and activities of their children.